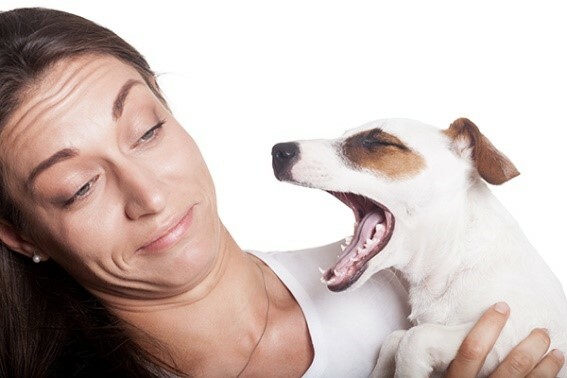 Does your dog suffer from bad breath? And do their sweet doggy kisses make you want to plug your nose? The solution is simple. Dogs need clean teeth just like you and me! They are at risk for gum disease and tooth decay, as well as infections which can spread and cause life threatening conditions. 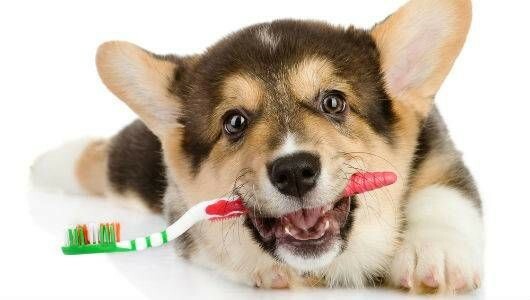 Here are some tips on how to set a healthy dental routine with your furry loved ones. Brushing just three days a week can make a huge difference. First, pick a time of day when your dog is calm and relaxed, maybe after a nice long walk or in the evening when things are winding down. It doesn’t matter what time as along as your dog is calm enough for you to stick a toothbrush in their mouth without an impromptu game of tug ‘o war. Using a toothbrush made for dogs can be helpful because the bristles are softer and special angled. Also be sure to use dog friendly toothpaste. Never use human toothpaste when brushing your dog’s teeth because it contains ingredients that are potentially dangerous for your pet. Many major brands contain additives such as sudsing agents which can lead to liver damage if enough is ingested. Two other toxic additives are xylitol and fluoride. Xylitol is commonly used as a sweetener, and dogs who ingest it are at risk of a surge in insulin followed quickly by a precipitous drop in blood sugar. It can also cause severe liver disease. Fluoride can cause a multitude of problems from digestive upset to irregular heartbeat, so please be safe and make sure to purchase pet toothpaste at your local pet supplies store. Comfort is key, so make sure your dog feels safe and relaxed – it’s always a good idea to kneel instead of standing over/above your dog. You don’t want your stance to be at all intimidating and if your dog seems too upset or anxious, just stop and try again later! 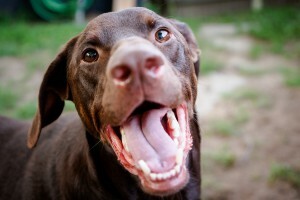 When it comes to your dog’s oral health, gums are just as important as teeth. You might want to start by gently using your finger to massage along your dog’s upper gums to help them get comfortable with the sensation. 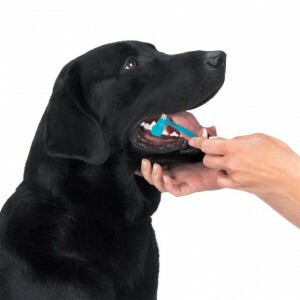 Next, try putting a small amount of toothpaste on your finger to and let your dog taste it so they can get used to the smell, flavor and texture. Then, put these two steps together and try this in combination with the toothbrush. Lift the upper lip and angle the bristles to reach the gum line, then gently brush in small circles. If you’re just getting started with regular brushing routine, some slight bleeding may occur. However, if your dog’s gums bleed every time you brush their teeth, it may be a sign that you are brushing too hard or they have a pre-existing condition that may need attention. If so, contact your vet! Last, but not least make sure you are reassuring during this process by patting your dog’s head and whispering sweet nothings into their ears and please end on a positive note. Give your dog a healthy teeth-cleaning treat (We love treats from The Honest Kitchen) and tell them they did a good job!